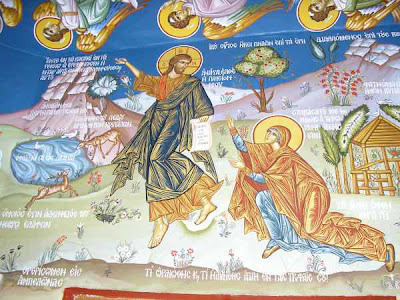 I found two beautiful pictures of frescos from the Monastery of St. John Makrinou, Megara (Greece). I've never seen any equivalents yet. 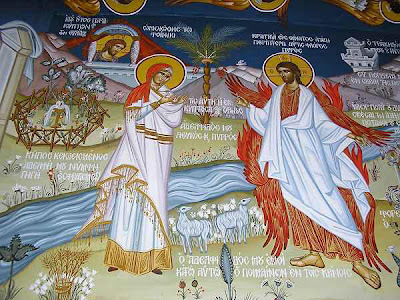 From what I can tell, they are depictions of verses from the Song of Solomon in the Old Testement. They are obviously depicting Christ in the icons, so they are interpreting the beautiful poetry of the Song as "eros" for Jesus Christ. They aren't very high resolution, so I can only pick out some of the verses, but here is what I can determine below (along with my amateur translation and rearrangement, after consulting with http://sepd.biblos.com/songs/8.htm and http://www.fourmilab.ch/etexts/www/Bible/Song_of_Solomon.html). love is strong as death...its coals are flames of fire; Many waters cannot quench love, neither can the floods drown it. -(7:6) τί ὡραιώθης καὶ τί ἡδύνθης ἀγάπη ἐν τρυφαῖς σου! comfort me with apples: for I am sick of love. What a beautiful expression of the person of Christ and His Love for us, and the love that the righteous show Him in return! May God have mercy on us, so that before our end we might be able to offer an infinitesimally small sign of our love to Christ! Amen!